This is a blended malt with whisky from Yoichi and Miyagikyo Distillery. 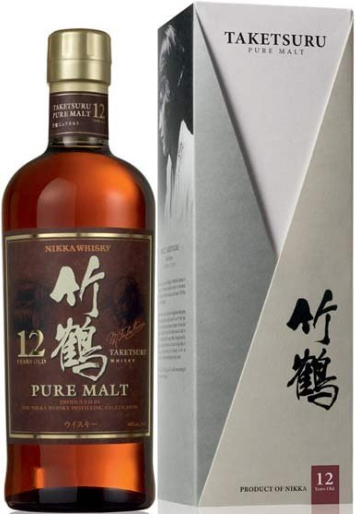 This Nikka range is named after the company’s founder, Masataka Taketsuru. After 10 minutes under a lid, the smell is absolutely compact. So many flavors. Sweet plums, flowers, mint and other herbs, wax, hints of vanilla and I could continue. A bit weak at first in the taste. Almost watery. Slightly salty, nuts, bitter apples and sweet fruit sweetness. The finish stays longer than I expected considering the taste. The sweetness and some light citrusy notes stays. A bit boring whisky to be honest. It started great with a good vibrant smell, but the rest couldn’t follow. After leaving it in the glass for a while, more and more citrusy notes comes forward in the smell and the taste. I will give this 80/100 (21/19/20/20).